Wordpress is is one of the biggest names in blog-publishing and website publishing worldwide. In fact, according Wordpress itself, 30 percent of all websites online use the platform - that’s roughly 500 million websites. We think that Wordpress is a great choice for bloggers, with some downsides for regular websites. Now, we should be clear and say that our review is looking at Wordpress.com, rather than Wordpress.org - they sound similar, but are quite different in the way they approach website development. We explain more in our section Wordpress.com vs Wordpress.org. Wordpress.com is great if you want to build a website or blog quickly and easily with minimal development, but want to keep your options open when it comes to scaling and improving your site. From here on out, we’re going to call Wordpress.com ‘Wordpress’. Put simply, if you want to use a website builder to create a blog, there’s no easier way to do it than with WordPress. 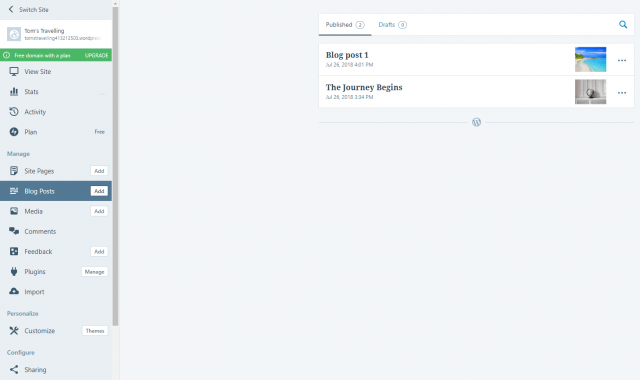 If we’re honest, we prefer Wix overall due to its increased design flexibility and feature set, but WordPress makes it super easy to build a blog. Not only is building a blog on WordPress a piece of cake, you’ll also be joining a massive community of WordPress users, who’ll be more than willing to give you a hand or point you in the right direction if you get stuck. Let’s take a look at how WordPress compares to the other website builders we’ve tested. Scroll horizontally to see full table on mobile. 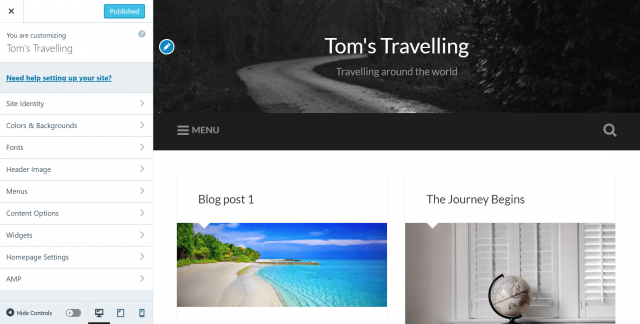 As we said above, WordPress is fantastic for creating blogs. It’s also great if you want to create a website quickly, and don’t need tons of advanced features. 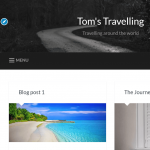 WordPress is an exceptionally simple platform to use if you’re creating a blog. You can create new blog posts in moments, then push them live in an instant or schedule them for a time of your choosing. Spotted a typo? It takes seconds to edit a page and correct mistakes. Adding images is as easy as dragging-and-dropping, and it’s simple to embed videos, too. For more, see our section on WordPress for Blogs. WordPress offers you hundreds of templates to choose from. Around 90 are available for free, with just under 200 available for an additional cost – typically between $30-100. Unsurprisingly, a lot of the templates are designed with blogging sites or online magazines. However, there are dedicated templates for businesses and online stores, including some free options. If you sign up for the ‘Business’ pricing plan, you’ll also be able to upload custom templates to your WordPress site, which, given the large user community, means that you’ll have almost unlimited choice. From the straightforward setup, through to how easy it is to create your blog posts, the WordPress interface is incredibly simple to use. 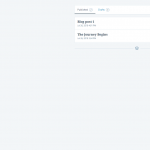 The sidebar controls make it effortless to control posts and pages as well as amend or update any of the site settings. The WordPress templates are also great at ensuring consistency across your site, meaning that you’ll spend less time changing small parts of your site and more time creating great content. WordPress isn’t going to be perfect for everyone, though, especially people looking to create a completely bespoke website. As we mentioned above, WordPress isn’t the most flexible tool for creating websites or blogs. The template you choose largely decides the positioning of on-site elements for you and there’s little scope to change and edit individual elements of your site beyond what’s available in the page or blog post text editor. This does ensure consistency, but given the way some website builders will let you customize your template without any hindrance, it does feel like something is amiss. WordPress offers hundreds, if not thousands of plugins which could be add functionality on your site for any conceivable purpose. Looking through the plugins menu, you’ll find everything from a button for users to export your media library through to a ‘Smoking vs Investment Calculator’, whatever that is. However, all of these are restricted to the users with the Business pricing plan. You can install widgets, but there are far less of these and are restricted to the footer of your site. Without sounding like a broken record, WordPress is outstanding for running a blog. Most of WordPress’ themes are designed to work as blogging websites – they display lists of blog posts, and it is just as easy to create a blog post as it is a new page on the site, unlike other website builders which require you to navigate through menus and sub-menus before finding the separate blog posts section. You’ll also find the blog post editor itself very intuitive – you can switch between the Visual editor, which gives you a ‘What You See Is What You Get’ view, and the Text editor, which lets you edit the HTML code on your site without restriction. Again, given the large and active community of WordPress users, this means that you are rarely more than a Google search away from finding the pre-written code to do exactly what you want on your site. Want to start a blog? Read our How to Create a Blog guide. WordPress.org is the big elephant in the room. While you can build a fantastic website quickly and easily with WordPress.com, it does seem, the deeper you delve in WordPress’ features, that WordPress.org is, overall, the better option. With WordPress.com you’ll be able to build a website or blog, without having to find a hosting provider. WordPress (the company) does that for you. You do, however, lose a degree of control and flexibility with your site. WordPress.org, on the other hand, necessitates that you find a separate hosting provider to be able to put your website on the internet. This can, however, work out cheaper than paying for WordPress.com plan. So what’s the benefit of going for WordPress.org? Mainly, that you have almost limitless control over your website. There are commonalities between the .com and .org versions of WordPress, in the way that they use a common WordPress interface to add content and manage the versions of your site. But you can dive much deeper with WordPress.org – provided you’re comfortable doing so. WordPress.org requires slightly more technical know-how to set up, and you’ll have to find a good hosting provider. But, for the added functionality, the compromise seems worth it. All told, we’d probably recommend building your site on WordPress.com first, given that it’s easier set up. You can then export your site to a self-hosted WordPress.org site once it’s up and running successfully. 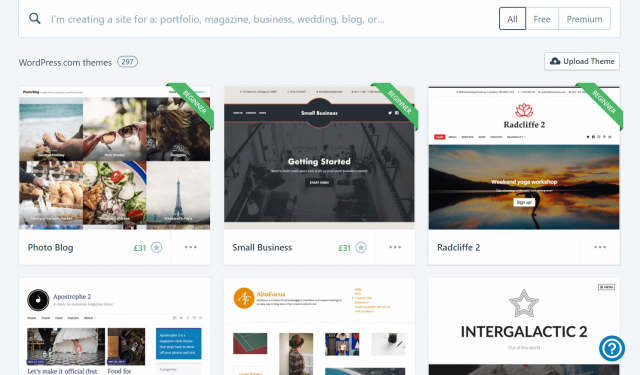 There are four WordPress pricing plans to choose from, including the indefinite, but unduly limited free package. All of the plans are billed annually or biennially – but the prices are quoted per month. If you’re serious about your WordPress site, the free package isn’t likely to be worth your time. It’s useful to get started with but unduly limited in the long-run. You’ll only have 3GB storage, WordPress advertising and banners plastered on your site and you won’t be able to access the professional WordPress support should you have a problem with your site. The Personal plan is the cheapest, costing $4 per month, and you’ll get a custom domain name, removal of WordPress adverts, and 6GB of storage space. If we’re honest, this probably isn’t worth the cost over the free version. The Premium plan is more expensive, costing $8 per month, and offers you access to premium website templates, an improved 13GB of storage and advanced social media functionality, such as scheduling. You’ll also be able to monetize your site with ad revenue and PayPal buttons, and use the Videopress video player, which will give you better analytics over embedding a YouTube video, for example. Finally, there’s the Business plan. It costs $25 per month, and we’ve mentioned before how this will give you access to plugins and the ability to upload custom templates. However, you’ll also get access to SEO tools and Google Analytics integration. If you’re adamant about making your WordPress site a success, you should go for this plan. Before you start creating your WordPress site, you’ll need to set up an account. WordPress begins by asking you questions about the type of site you’d like to create, what you’d like to call it and the purpose of your site – it also asks you how confident you are creating a website. Once you’d filled in this info, you’ll be asked to pick a domain name for your site. This can be different to the actual name of your site (for example, the Financial Times website has the domain name, ft.com). However, we’d recommend keeping your domain and site name the same, or at least as similar as possible. One thing to be wary of, is that you’re unlikely to get your ideal domain. Not all of WordPress’ alternatives are free and you’ll likely have to sign up to a paid-for plan to get the domain name you’re after. Once you’ve picked your domain, you’ll be taken through to a choice of payment plans (more on these later). Then you create your account, it might seem backwards to create your account last, but it’s so WordPress can show you exactly what you’ll get before committing to sign up. Now it’s onto picking a template, or theme, as WordPress calls them. 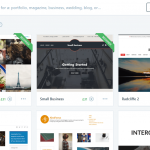 There are loads of potential themes to choose from with WordPress. Although, again, not all of them are free to use – some can even cost in excess of $100. However, the free ones are generally very good. After this, you can start creating and posting blogs, or adding content to your site. The WordPress page editor tends to be more restrictive than most other website builders, making your template selection extra important – although you can change template at any time. WordPress is a good choice for people looking to build a website and a great choice for anyone looking to blog. However, it does lack the customization options offered by other website builders. Instead, it offers nearly limitless templates to create your perfect site. All told, it’s a different way of building a website, and one that you’re unlikely to outgrow as the number of visitors to your site increases. However, you might find that adding features can be fiddly and you’ll likely always be wondering whether the grass is greener with a WordPress.org site.